Yes! As fans we love watching interviews! And we're not that picky: two minutes, five minutes, thirty minutes, as long as we learn something, it doesn't matter. But the longer the interviews are, the more excited we get! 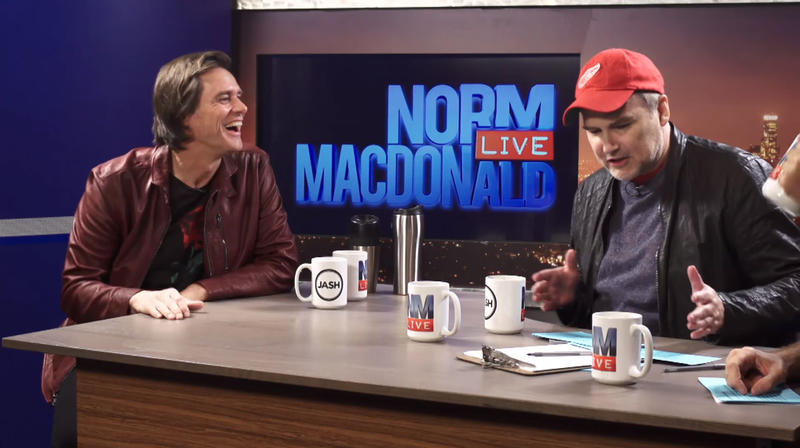 Jim Carrey was Tuesday interviewed at 'Norm Macdonald Live', a weekly podcast hosted by Canadian Norm Macdonald and his co-host Adam Eget, featuring interviews with comedians, actors, and other members of the entertainment community. The interview was deliciously good to watch and it will make you laugh out loud! It starts with Jim Carrey messing with the camera sparking the first of many laughs. He also shared some special coffee with cacao - a word that originated some jokes. They discuss some of the histories regarding Andy Kaufman and Bob Zmuda, including how they "prank" the late Hugh Hefner by having Bob Zmuda pretending to play Jim Carrey playing Andy Kaufman playing Tony Clifton and then having Jim Carrey show up. There were many laughs during the interview and when Jim asked: "Remember when you came and visited the set of "Man on the Moon?" Macdonald: "Oh sure, yeah. I was also in the film." Jim also decided to do a studio makeover by removing the letters from Norm's desk. They talk about comedians and comedy and Jim Carrey's early days as an impressionist. He continues to play off his surroundings, messing with a dog at the studio and showing his reverend of facial expression to everyone's delight. During the interview Jim talked about "Batman Forever" and working with Tommy Lee Jones (costarred as Two-Face) and how they did not get along. 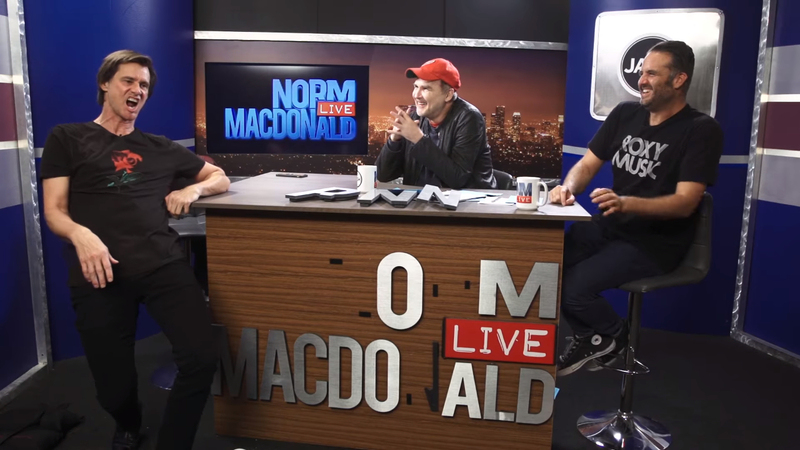 "I was the star, and that was the problem," Jim said on Norm Macdonald Live. "Phenomenal actor, though. Still love him." As Jim explained, he met Jones at a restaurant before they worked on the film together. "I went over and said, ‘Hey, Tommy, how you doing?’ And the blood just drained from his face like he had been thinking about me 24 hours a day. … It was before the biggest scene we have together in the movie. The blood just drained from his face. He started shaking and he got up and … he must have been in mid-kill-me fantasy or something. He went to hug me and said, ‘I hate you. I really don’t like you.’ I said, ‘Gee man, what’s the problem?’ I pulled up a chair, which probably wasn’t smart. And he said, ‘I cannot sanction your buffoonery.'" Jim added that Jones maybe wasn’t comfortable with the comic-book material. The TV Series "I'm Dying Up Here" was also discussed and Jim mention that the casting for it was decided in one night at the comedy club, where Jim said: "It was one of the greatest nights, ever!" Jim also talks about his beliefs as well as continues to play and makes cry of laughter. This was more than a good interview, this was excellent! We're thrilled to see Jim so happy! -- Source: Norm Macdonald Live. With thanks to Terry Marvin and Anikó Kovács. Click to comment this article.